Structured dialogue between young people and the Prime Minister of the Republic of Slovenia Miro Cerar, PhD, at ABC Hub • BTC d.d. The introduction to the conference was made with speeches by the Managing Director of the Youth Network MaMa, Maja Hostnik, M.Sc., the Managing Director of the Office of the Republic of Slovenia for Youth, Peter Debeljak, PhD, and the Vice-president of the National Youth Council of Slovenia, Daniel Valentine. Expressing their support upon visiting the event were also the State Secretary at the Office of the Prime Minister of the Republic of Slovenia, Tadej Slapnik, and the Managing Director of the Institute for the Development of Youth Mobility MOVIT, the National Agency for the Erasmus+ Programme – Youth sector, Uroš Skrinar. The dialogue between young people and the Prime Minister of the Republic of Slovenia, Miro Cerar, PhD, focused on 4 main topics: Youth and Entrepreneurship, Employment of Youth, Inclusive society/Europe, and Youth Sector. In his introduction, the Prime Minister of the Republic of Slovenia pointed out one of the primary tasks of the Government which is creating a stimulative business environment. “The Government needs to watch over the entire society – a fact we sometimes forget, especially since even the most marginal areas are a part of the whole. That being said, entrepreneurship is also closely connected to sports and culture. Therefore, it is of utmost importance to focus on the development in every segment of society and not merely on one,” he emphasised. When asked about the incentives and aid for start-up businesses, Miro Cerar, PhD, explained that the state gives a part of the means directly to entrepreneurs, as well. “Start-up businesses received direct financial aid; in 2016 212 firms received 20 million Euros” stated the Prime Minister as a specific example of aid and added that the role of the state in the form of training seminars should not be pushed aside, since they are extremely important for young entrepreneurs. “We wish to upgrade the existing process of education in Slovenia by connecting the educational and especially the university/research sphere with economy more, meaning we show great support to university incubators and above all to gaining competence knowledge,” concluded the Prime Minister. “For a young person to have a job is extremely important, since it is what makes them a person in full.” Miro Cerar, PhD, answering a question from the audience. When asked about the relationship between the professions sought for and the actual offer of professions, the Prime Minister replied: “In Slovenia, several areas of vocational knowledge have been neglected. There are many firms with vacant job positions waiting to be filled, but there is no one with corresponding knowledge to fill them.” He added that he can imagine it must be painful for individuals to find themselves in an “unemployment vacuum” after they finish their schooling. However, he also added that the government is trying to strengthen the economy and consequently create new job positions. The Prime Minister of the Republic of Slovenia, Miro Cerar, PhD, especially emphasised his content about the fact that young people with fewer opportunities – deaf and hard-of-hearing youth – took part in the project of a structured dialogue. When asked about the youth employment quota, the Prime Minister responded that the field in question would have to be considered more thoroughly and that the matter should be discussed with experts or authorised individuals who know what had already been done, since “sometimes quotas represent a good thing and sometimes they do not.” He stated that it is not just about young people but also about certain groups, about young people with fewer opportunities, about women, etc. Regarding a higher level of political involvement of young people in any form, the Prime Minister said that as long as politicians are seen as a group of people for whom the nation has no respect, there would be, according to his opinion, no interest by young people to become actively involved in politics. “I wish for this to happen; we need to provide the young with a chance of integration and employment. A part of the decision lies upon you, young people, and the rest is up to us. It is our responsibility to create a more understandable and pleasant political milieu. I will strive towards this,” concluded the Prime Minister. Regarding the youth initiative mentioned on the notion board about the transfer of good practices from the youth sector to economy, the Prime Minister of the Republic of Slovenia stated that he welcomed the idea and encouraged young people to provide the structure for it, write it down and send it to his office. 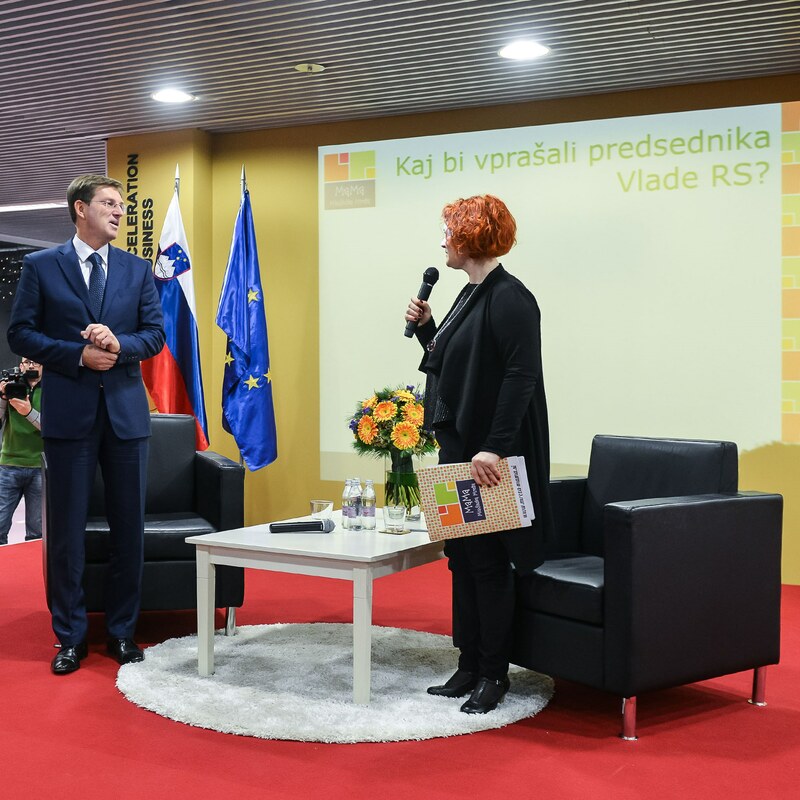 The Prime Minister of the Republic of Slovenia was also asked a direct question regarding the National Vocational Qualifications – Youth worker, especially in the sense of what his contribution in this area could be. He answered that he could try to speed things up and that his efforts in the days to follow along with the state secretary Tadej Slapnik and his team will focus on the matter, as well. Young people and the Prime Minister of the Republic of Slovenia also discussed the issue of precarious work, circular economy, tolerance, the cooperation of different sectors, etc. With the intention of a broader inclusion and the support for young people in every local environment, the Youth Network MaMa included over 80 students from different secondary schools across Slovenia, along with youth workers of all 46 members and other proactive young people in the dialogue; the number of all participants reached 165. The key to the entire project is to show young people they possess all the levers and mechanisms to contribute to the formation of society. The important thing for them is to utilise these mechanisms. To help this happen, the organisers arranged a training course for 20 youth workers from local youth centres and youth councils in the beginning of September. The workers showed commitment and encouraged young people in their local environment to take part in local consultations along with local decision-makers, the topic being entrepreneurship, creating new job positions, the employment of young people, and enabling all young people the participation in a heterogeneous, connected, and inclusive society. The same notions were observed in a dialogue with the Minister of Education, Science and Sport, Maja Makovec Brenčič, PhD, in LokalPatriot pub – details, video. Young people involved in a structured dialogue gain additional knowledge and competences in the field of communication, self-initiative, organising and realising projects, public appearance and advocacy. They also learn about active citizenship and the participation in a modern society and in light of changes. The conference began in the morning with a presentation of 2 local campaign examples of good practice – the Youth Cultural Centre Maribor and Deaf and hard-of-hearing youth. Both presentations carried great depth, the first one covering the topic of LGBT inclusion of young people in a local environment, and the second one a very sensitive area of rights of young people with fewer opportunities – young deaf people. The young were also addressed by Sebastjan Jeretič who introduced the results of the project from the perspective of communication and emphasised the importance of the field of creative communication of young people. After the dialogue with the Prime Minister of the Republic of Slovenia, young people had their photos taken with him and shared with him their ideas in an informal conversation. After the break, the programme continued with the presentation of remaining 2 local campaign examples of good practice – the youth organisation Mladinska postaja Moste and the Youth Cultural Centre MKC Slovenj Gradec. The first one is a successful story about setting up a creative area for young people, while the second one represents the inclusion of young people in an active involvement in the society – about a young successful entrepreneur. Prior to the host’s concluding words there was also a presentation by Metka Kuhar, PhD, from the Faculty of Social Sciences who introduced the field of young people from different statistical indicators which she included into her presentation of the field of youth. The structured dialogue has been realised for the 5th year in a row by the Youth Network MaMa in cooperation with the National Youth Council of Slovenia. The project has been supported by the Erasmus+ programme Youth in action, covering an extensive field of connecting young people on a local level with the intention of influencing decision-makers on a national level.